Buchwheat Sourdough Pancakes are made with buckwheat flour. A relatively new to me flour. I went on a quest to find more information on buckwheat and was pleasantly surprised. Buckwheat grouts and buckwheat in general, is not only good for you, it is packed full of delicious flavor. with the light buckwheat flour I picked up. I have to admit, they were really delicious. Actually sourdough buckwheat pancakes far exceeded my expectations. We really liked the buckwheat and sourdough flavor combination that the pancakes had. 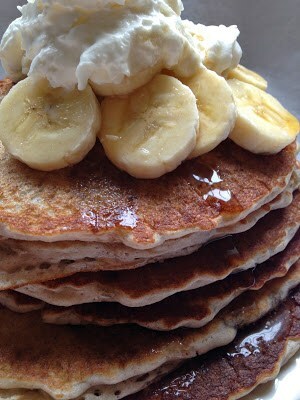 We enjoyed the pancakes with sliced banana’s, maple syrup and whipped cream. Delicious!! Buc Wheats was a cereal made by General Mills in the ’70’s. I’m not sure how much “Buckwheat Flour” or “Buckwheat” was in Buc Wheats Cereal but loved I loved them. On the box of Buc Wheats cereal is claims that they’re made “With a Snap of Maple Flavor” I sure loved that cereal and was so sad to see it go. Do You Remember Buc Wheats Cereal? What was your favorite kind of cereal when you were growing up? Was it: Clackers, Sugar Jets, Kaboom, Cookie Crisp, Waffelos, Quisp, Ice Cream Cone Cereal, Donutz Cereal, Sir Grapefellow, or Crispy Critters Cereal! In a large bowl, mix together sourdough starter, buckwheat flour, and milk or buttermilk. Leave on counter top, covered, overnight until bubbly. To the batter add: baking soda mixed with 1 tablespoon water, egg, pinch of salt and sugar. Stir together. 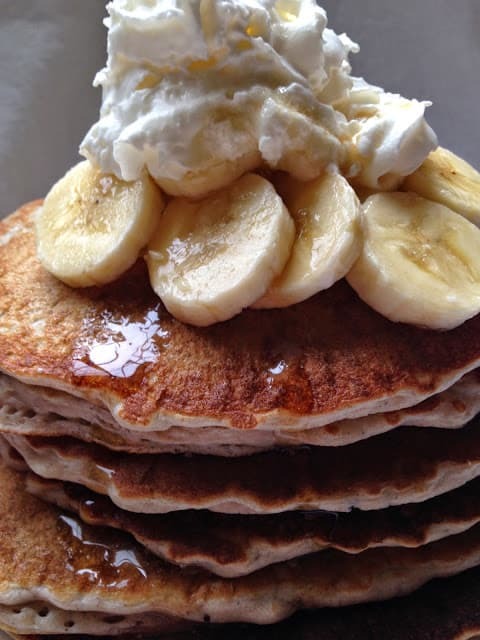 Make pancakes asap after mixing in the baking soda mixture and other ingredients. Heat griddle until hot, lightly grease. Pour batter onto hot surface, cook until bubbles appear on the surface and edges of pancakes look dry, flip over and cook until lightly browned. 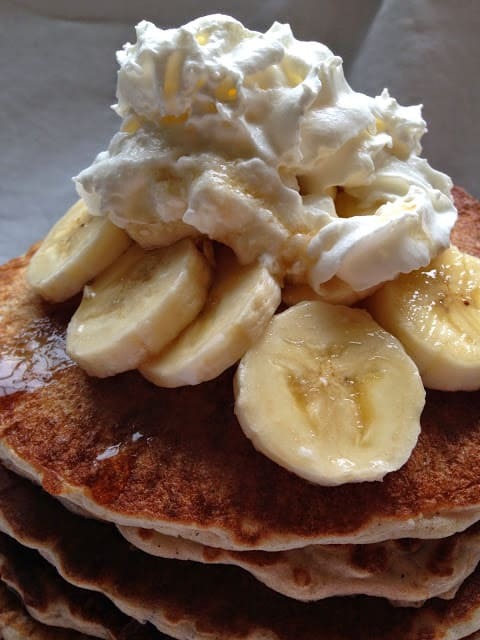 Serve with sliced fruit of your choice, maple syrup and whipped cream, if desired. Buckwheat Flour is flour ground from Fagopyrum esculentum, more commonly known as Buckwheat. It has a rich, nutty flavor and a very high nutritional value, making it popular everywhere, especially in Asia. In addition, it’s gluten free. People with gluten intolerance seek it out as a flour alternative. Buckwheat is Actually a Fruit? Although Buckwheat is treated as a grain, Buckwheat is not a cereal or grass but actually a fruit, closely related to wild rhubarb. The grain-like fruit of Buckwheat is what is harvested and eaten after the hard outer husk has been pulled away. In addition to making flour, people crack it into grouts and steam or boil them in puddings and porridge. Buckwheat is planted as a cover crop for beekeeping, since it produces a high volume of flavorful nectar. Next time you see Buckwheat Flour in your area pick up a bag and give it a try. What a great flavor combination buckwheat and sour dough. 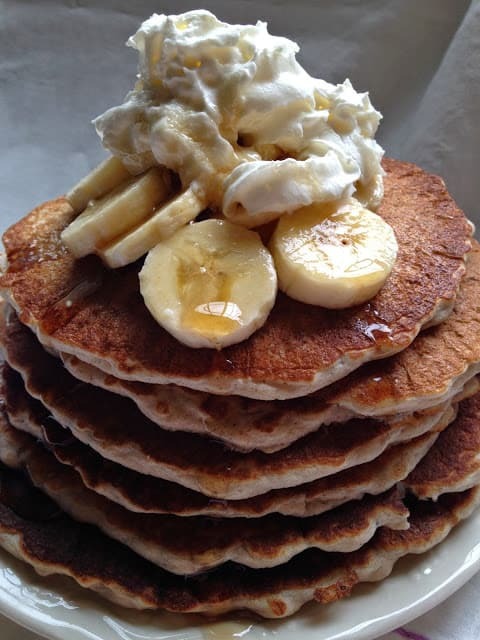 Thanks for bringing your pancakes by foodie friday. Thanks for sharing this recipe. The pancakes look delicious! My family and I just made the switch from using white/AP flour to whole grain flours. I'm struggling to find good tried and true recipes that we can use. The good thing is: It's causing me to explore more options and blogs. The bad news is: It takes a lot of time!! (BTW, while I currently live in rural upstate NY, I'm originally from Marinette, WI! I miss the friendliness of WI folks, so you can be sure I'll be back to visit.) 🙂 Enjoy your day! My family would love these! 🙂 Thanks so much for sharing at Freedom Fridays!